Andre De Grasse highlights a busy day of competition at Rio 2016 on Thursday, as he’ll go for his second medal at the Olympics in the 200 m final. After going without a medal on Wednesday, Canada could and should win multiple medals today. Here’s a list of events to keep an eye on today. Track and field is jam-packed with activity on Thursday. 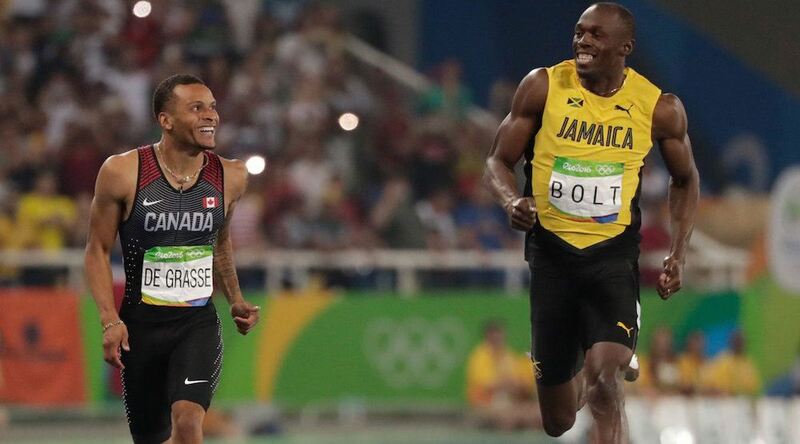 Usain Bolt and Andre De Grasse, whose bromance is developing before our very eyes, are the favourites to go 1-2 in the 200-metre final. Justin Gatlin, the silver medal winner in the 100 m race, shockingly failed to qualify for the final. Canada’s Damian Warner is in third place heading into the final day of the men’s decathlon competition. American Ashton Eaton is in first, and expected to get gold. Canada also has a shot at a medal in men’s shot put, with #6-ranked Tim Nedow of Brockville, Ontario. Melissa Bishop runs in the semi-final of the 800-metre race. She ran the fastest time of all competitors in the qualifying round heats. Finally, Canada’s 4 x 100 m men’s and women’s relay teams will try to qualify for the finals. Canada’s women aren’t expected to advance, while the men are medal contenders. The Canadian team of Ryan Cochrane & Hughes Fournel have qualified for the final, but are not expected to earn a medal. They qualified with the sixth fastest time of the six teams in the final. We’ll see if they can surprise some people. Medals will be handed out in men’s field hockey on Thursday. The women’s volleyball tournament is nearing the end, as four teams compete in the semi-finals. Coquitlam’s Tory Nyhaug raced his way to the 18th seed heading into the quarter-finals. We’re into the semi-finals in women’s basketball as Spain and Serbia battle it out for the right to be crushed by USA in the final. Or maybe there’s a miracle to look forward to? Julio Cesar La Cruz (Cuba) goes up against Adilbek Niyazymbetov (Kazakhstan) for the gold medal. Roseline Filion and Meaghan Benfeito, bronze medallists for Canada in synchronized diving, are medal contenders in the individual event as well. *Update: Erica Wiebe has advanced to the gold medal match in women’s 75 kg freestyle wrestling. Brazil lost the gold medal match in women’s beach volleyball on Wednesday, so it’s up to the men’s team to reach the top of the podium at Copacabana for the host nation.